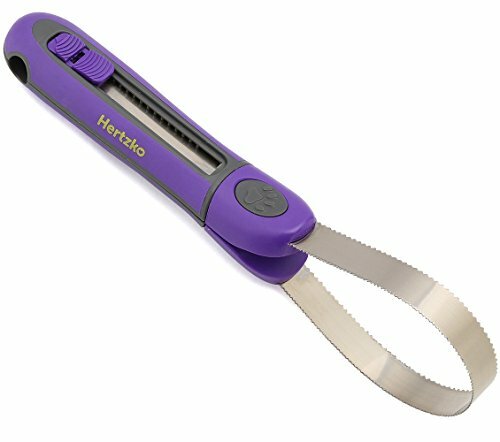 Great for All: Hertzko's Deshedding Blade can be used on SHORT and LONG haired DOGS and CATS; both small & large. Make Grooming your pet A Comfortable and Pleasant Experience- Our Versatile Deshedding Tool gently removes Loose Hair, and Drastically reduces shedding up to 90%. Even after the first use, you will notice less hair around your house and your pet's hair will be much softer and sleek! What is your risk? Nothing. If our Deshedding Tool is not everything that we say it is, and you're not completely satisfied with it within 30 days of purchase; we will refund every penny of your money, straight away. Get the Hertzko Versatile Deshedding Tool today and You will not regret investing in high quality products. Click the Add to Cart button now and treat yourself and your pet by getting the Hertzko Deshedding Tool! ★ GREAT TOOL TO REMOVE DEAD HAIR AND REDUCES SHEDDING AROUND THE HOUSE - Hertzko's Versatile Deshedding Tool gently removes Loose Hair, and Drastically reduces shedding up to 90%. ★ BLADE FEATURES COARSE AND FINE TEETH FOR LONG AND SHORT COATS - Hertzko's Deshedding Tool works great on short & long haired dogs, cats and horses. ★ SIZE ADJUSTABLE! Unique looped blade conveniently slides in and out of handle to create a variety of sizes suitable for large or tight grooming areas. Blade length can be increased by 5 inches! And once you've reached the size you want, simply slide the button downwards to lock the blade length for a safe experience. ★ BLADE CAN BE USED EITHER LOOPED OR STRAIGHT - blade easily separates at the handle for straight-bladed operation when covering larger areas or to sweep excess water from your pet's coat after bathing. ★ YOUR PET WILL NOT ONLY 'LOOK' GOOD BUT 'FEEL' GREAT TOO! - Our Grooming Tool Grooms and Massages for a healthy coat, increasing blood circulation and leaves your pet's coat soft and shiny. Your Pet will love being combed!